This Friday, June 27, will represent the eighth straight week of demonstrations in downtown Detroit in opposition to emergency management and the role of the banks and corporations in the ongoing dismantling and destruction of the city. Weekly Freedom Fridays are endorsed by: Moratorium NOW! Coalition, National Action Network-Detroit Chapter, Detroit Eviction Defense, Detroiters Resisting Emergency Management, We the People of Detroit, and Food Justice PMA. The participants are calling on everyone to gather at the Detroit Water and Sewerage Department located at 735 Randolph beginning 4:00 p.m. At present thousands of households are being subjected to illegal water shutoffs at the aegis of the bank-imposed EM Kevyn Orr who is seeking to drive even more people from the city as part of the “Grand Theft Bargain” they are implementing on behalf of the criminal corporations and financial institutions. These water shutoffs are being carried out by a private firm hired by the outlaw EM utilizing the tax dollars of residents. 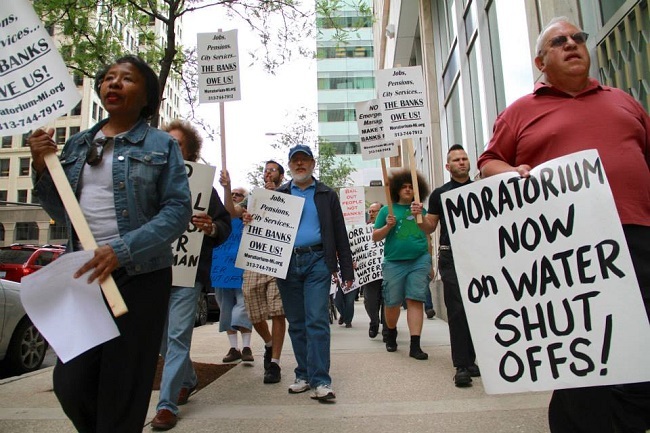 The aim is to illegally seize the water department from the people of Detroit and turn it over to private interests. It is the banks which have swindled the taxpayers out of $500 million in fraudulent interest-rate swaps tied to the DWSD, funds that should be used to repair water main breaks and other infrastructural improvements. At 4:30pm a march through downtown’s financial district will begin to protest the role of Chase Bank, Bank of America, Quicken Loans, EM Kevyn Orr, Gov. Rick Snyder, the illegal Land Bank Authority and other entities which are responsible for the wholesale dis-empowerment and exploitation of the people of the city and the region. We will then march to Grand Circus Park for an open-air Emergency Town Hall Meeting beginning at 5:00 p.m. on the need to continue and intensify the fightback against the banks, corporations and their agents at City Hall and the Capitol in Lansing. All workers, retirees, community activists, youth who are committed to progressive change are inviting to attend and speak. We are calling for the total rejection of the bogus “Plan of Adjustment” and the immediate ejecting of the EM Orr. Pensions, healthcare, public assets, the DIA, DWSD, Belle Isle, Detroit Public Schools and all other properties of the city must be protected from the corporate looters who have taken control of the state and local governments in Michigan. Pensioners, workers and all other so-called “creditors” should vote NO on the bankers’ plan of adjustment. Local control must be restored and the capitulationist program of the City Council and the comprador mayor from Livonia should be resisted by the workers, seniors and youth of Detroit.